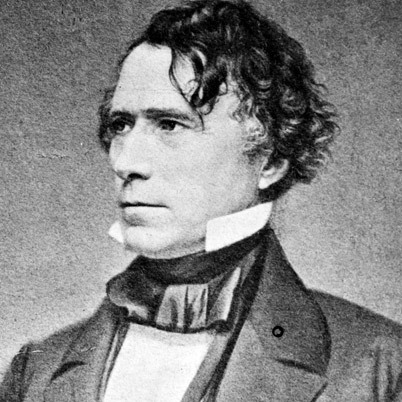 I would love to tell you Franklin Pierce’s life will be the foundation of many fascinating biographies. Following Zachary Taylor and Millard Fillmore it seems hard to imagine enduring 1,300 pages about another dull and apparently unsuccessful president. Unfortunately, all signs point to Pierce proving bland and fatiguing. For one thing, I can’t recall his name being mentioned even once in any previous presidential biographies. That’s never a good sign. He was active in local and national politics for nearly fifteen years before running for president – as a state legislator, a US Congressman and a US Senator. He also served as a brigadier general in the Mexican War. And yet I honestly don’t recall seeing reference to his actions as a young legislator (or as a military hero…or as a political mastermind) anywhere. Clearly Pierce and I are not off to a frolicking start. But like the presumably unexciting former presidents who came before him, I’ll give Pierce the benefit of the doubt. Nearly every chief executive from Washington to Fillmore has been more interesting than I expected – even many of the unsuccessful ones. I sincerely hope the fourteenth president will also exceed expectations. Unfortunately for Pierce, the presidency seems not to have been his higher calling. He was replaced by James Buchanan as the the Democratic party nominee during the next presidential election cycle and left the White House dejected and unpopular. He became famously reclusive and later found comfort in alcohol, which sped him through the last days of his life. The first biography of Franklin Pierce I’m reading is “Franklin Pierce: Young Hickory of the Granite Hills” by Roy Nichols. This seems to be the classic Pierce biography and was published in 1931. My edition was revised by the author a few decades ago with the addition of a new final chapter revisiting Pierce’s life and legacy. Until recently, Nichols’s biography was the only complete, full-scale account of Pierce’s life. Next I will read Peter Wallner’s two-volume biography of Pierce. The first volume (“Franklin Pierce: New Hampshire’s Favorite Son“) was published in 2004 and focuses on his life through his election as president. The second volume (“Franklin Pierce: Martyr for the Union“) was published three years later and follows Pierce through his single term as president and his retirement years. This account promises to be the most sweeping biography of Pierce ever published. When I get to these presidents I believe the only thing that will keep me interested is the fact that Abraham Lincoln is just around the corner. Indeed! I almost mentioned that what’s probably going to get me through Pierce (and Buchanan next) is the stack of Lincoln biographies I’ve been waiting for 2+ years to read. I can’t keep up with you, you are moving right through these presidents. But Lincoln biographies could take you the rest of your life. I have trouble remembering the presidents in the 1840s and 1850s, but I just got presidential Pez (first five volumes), so somehow it’s easier for me to remember them when I can recall the order in the box. Buchanan has a snazzy tie! Super coincidentally, a friend of mine just sent me Presidential Pez for Washington through Buchanan. Literally…this past week! Did they just come out and you were both timely, or was this random synchronicity? It does look like Lincoln is going to take me all spring, from early March to late May. But I really can’t wait. A little random synchronicity, I think. I saw the first presidential Pez (Washington through Monroe) in summer 2012. Then over the holidays, I saw volumes IV and V (Lincoln through T Roosevelt). I sent my friend on a quest to get volumes II and III. Volume VI should come out this fall.